The fairytale of Little Red Riding Hood is known by virtually everyone, with the target audience obviously being young children. The story has slight differences in some versions, but needless to say, the core elements remain the same, including the relatively short time it takes to tell the tale. Therefore, Little Red and The Big Bad Wolf was an intriguing prospect. How do you take a story which everybody will know, and which doesn't last too long, and create a theatre show out of it that will maintain interest and provide entertainment for attendees of all ages? Well, anybody who feels that this is an impossible task would be surprised, because Little Red ... ticks all the boxes, whilst adding some unique layers which ensure that it stands out from the classic fairytale. You won't need me to explain the plot, but I will tell you why this show is different. For starters, there are a number of original songs featured in each scene, which help to either move the story along or emphasise certain character traits. 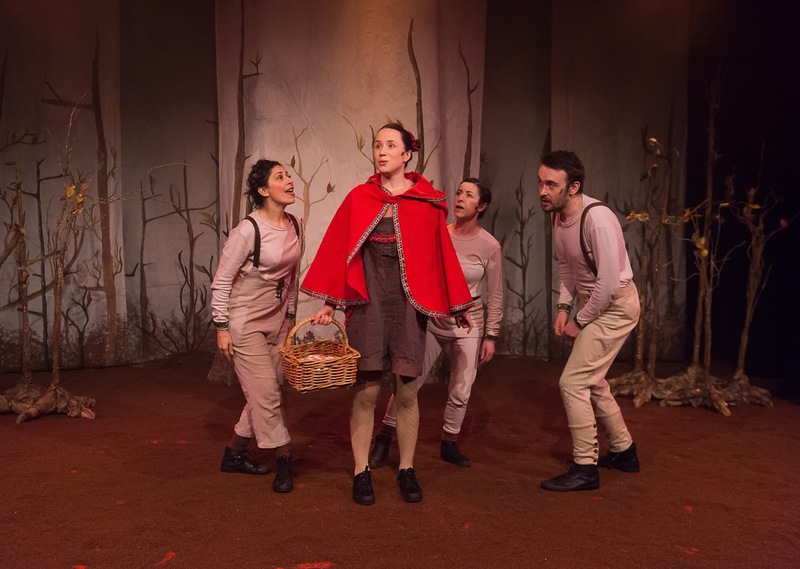 The settings are also a stand-out element: we're taken into the woods, including the use of gravel to represent the muddy fields walked through by Little Red. But it's the use of comedy which helps to make this show: there are frequent moments of comedy, ranging from standard lines appealing to younger members of the audience to clever one-liners and even some occasional ad-libbing to match the opinions of those warning Little Red and her grandma of impending doom. I also appreciated the smaller touches: the story wasn't afraid to poke fun at itself on more than one occasion, and there are also nods to other classic fairy-tales, including one amusing reference to Jack and The Beanstalk. The costumes were effective, and helped to hide the fact (or perhaps promote it in a satirical manner) that the same crew of four performers were playing all of the characters (besides Luca Rutherford, who plays Little Red, the remaining members of the cast have more than one role). Speaking of which, all four actors and actresses - Luca Rutherford, Harvey Robinson (who plays the Big Bad Wolf), Simone Lewis and Natalia Campbell - adapt well to their interesting surroundings (a greater achievement considering the very intimate theatre setting for the show), with each having an important part to play and with the performances being strong throughout, ranging from drama to comedy to mild horror (one very young child near me got a bit frightened towards the end!). And without spoiling the details, I will urge that the kids look out for moments of audience participation, as there may be a chance to not only get involved, but to also pick up a little treat! The only thing I would say which could have been better was that, as a show which will be held over the Xmas season, there wasn't anything particularly Christmassy. Some decorations, one holiday-themed hit or even a Christmas-related scene tacked onto the finale would have gotten the young 'uns into that festive spirit. Otherwise, though, this was a really fun show, one perhaps better for those who have kids aged between 5 and 10, but I feel that all members of the family will enjoy this unique retelling of a classic story.